In the privacy of your home, you and your guests are invited to a personal instruction Sushi Party: Lesson Event. Otolith will provide an instructor and an assistant plus all the necessary ingredients and supplies required for you and guests to make and enjoy eating (3) hoso maki sushi rolls per person at a Sushi Party hosted by you. You provide the location, select the fish or shellfish from Otolith’s highest quality sushi-grade sustainable seafood and invite your friends. 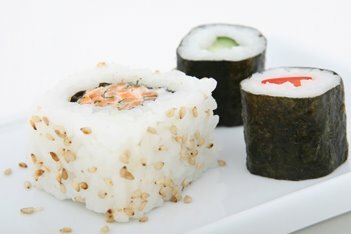 (2) species of Otolith’s sustainable seafood, cooked rice, nori, (4) variety of vegetables sliced thin lengthwise, organic soy sauce, sesame seeds, pickled ginger, wasabi, seaweed salad, green tea bags, mochi dessert, hot/moist hand towels, rolling mats, chop sticks, sushi plates, tea cups, condiment saucers, napkins, cold trays for handling raw ingredients, fish knives and complete personalized hands-on instruction for thawing sushi grade seafood, preparing rice, elements of sushi design, rolling hoso maki sushi (small nori rolls with rice and fish), and how to cut sushi maki. Call 215.426.4266 to speak with an Otolith representative. Your call will be returned within 24 hours. Sushi Party: Lesson Event dates and availability exclude Wednesdays, Sundays and national holidays. Reservations are recommended at least 14 days in advance of your Sushi Party: Lesson Event. A $200 non-refundable deposit is required to schedule your Sushi Party reservation. Sometimes even the best plans can fall apart. If you cancel your event at least 24 hours prior to your scheduled reservation, Otolith will always reschedule your Sushi Party: Lesson Event free of charge. Cancellation requests made within 24 hours of the scheduled reservation are subject to the discretion of your Sushi Party: Lesson Event instructor; you may be ineligible to reschedule your Sushi Party and your deposit will not be refunded.